I order a Grizzly Pro Video remote control system the first of December and it finally arrived this afternoon. I spent the whole afternoon hooking it up and learning how to use it. My first test were very impressive. I filmed the red birds in the back yard for about half an hour. Mary was impressed with the results. The preacher was at his best today and the video and audio went smoothly. Even the meal after church was great. The Lord was good to us again today. I think we finally finished painting Scott and Lacy's house. We spent a hard afternoon painting the last room including the trim. They called the carpet layers and made an appointment for next week. This afternoon we painted all the trim work and lots of shelves in the office area of Scott and Lacy's new house. When we finish painting the walls in this room, this will hopfully compete the painting project. 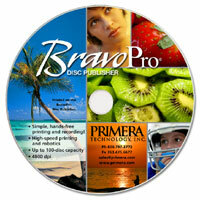 We received a new BravoPro disk printer this afternoon. I designed and printed my first DVD for the Lawson Elementary School Christmas Program and it looks fantastic. I think people will be very pleased to receive a DVD printed with a label from this printer. I took my old Kyocera KR1 Broadband EVDO Router to David and Ann this afternoon and got his new Sprint Merlin S720 Datacard working with it. They were tickled to have broadband access to the internet. Mary and I enjoyed a very Merry Christmas today. We spent most of the morning with Scott and Lacy and enjoyed a great pancake breakfast. We then spent some time with Lee and Angela. I helped Angela install her new microwave that Lee gave her for Christmas. I spent a lot of time today helping Mary get things the way she wanted them on her new computer I gave her for Christmas. It's her first computer that was not a hand-me-down. Angela invited us up for supper tonight. The meal was just what I needed. After supper we all piled into our mini-van and drove around Little Rock looking at the Christmas light. We payed $5 to drive through Burns Park in North Little Rock and it was good. Then we went to Sherwood Forrest and made another $5 donation. It was the best of all. We really enjoyed our drive through the forrest. On the way back across the Arkansas River we went through a nighborhood and one of the houses had just gone all out with their Christmas Lights. We throughly enjoyed the lights tonight. On the way home Preston and Drew sang all the songs from their Christmas Program at Lawson Elementary. That made the evening complete. What a great way to spent our Christmas Eve. The Lord has been very good to Mary and I today. Mary had been very concerned about our church Christmas Canta tonight at Crystal Hill. She knew they had not worked on it near enough to have it down pat. We ask the Lord for a special measure of His grace and blessing for the singers tonight. They did an excellent job. They nailed every song right on key. Mary's solo turned out just perfect this morning and again in the Canta tonight. The Lord was very good to our church today. Praise His Name! The VX2100 Video Camera that gave me fits last Sunday is finally fixed. The last person who owned the camera had made some custom presets that I did not understand until this afternoon. I spent a lot of hours with the cameras this afternoon and I think I am ready for the services in the morning at church. We spent most of the painting the trim around the floor, ceilings, door frames and window frames at Scott and Lacy's new house. Things are beginning to really look good. Tonight I had to suffer the pain of Christmas shopping. Cars bumper to bumper everywhere. Stores jammed with people. I finally got Mary's Christmas bought. I was very glad to get home tonight. We made it to the living room today painting Scott and Lacy's new house. Tonight I helped install some new lights over the choir loft in our church. My body is really feeling the pain of all this manual work. And then I have to remember I can not go back to Embarq to rest up after vacation. More Painting On Scott's New House. Tonight we atteded church at Crystal Hill. The message was just what I needed for this time in my life. Second Day Remodeling Scott's New House. We finished up installing a new central heating unit in Scott and Lacy's new home in North Little Rock today. We also painted one of the bedrooms. Scott is really learning how to use his left hand without the two missing fingers. It still hurting him a lot but he just keeps right on going. We attended the Lawson Elementary School Christmas Program tonight. We got there early and I got in the middle of the front row and set-up one of my new VX2100 video cameras. When we got home we watched the Christmas Program again. I was extremly happy with the quality of the video and audio. I think I'll give away DVD's of the program to the parents as a way to help advertise our new videography busines. The white balance seemed to be all wrong for the morning service. I spent a couple hours this afternoon trying to adjust the white balance. It seems like no matter what I do that I can not get a picture from all three cameras to look the same. I think I need help from a pro but I don't know anybody to ask. I'll just have to keep trying to learn how to use these new cameras. Surley there is an answer somewhere. I have been buying 3 new Sony VX2100 over the course of the last couple weeks so we could start a little videography business. We would like to shoot video for some kind of event often enough to buy groceries and pay the bills. Today I installed the new cameras at church. I hope to use them as often as possible for the Lords work. Preston and Drew was a great help to me this evening unloading the Penske. I put off unloading all day until late this eveing. I sure was glad they came along to help me out. This is the third day in a row of loading and unloading. My back is about to give out on me. I need to go back to Embarq so I can rest up. Thank the Lord for grand children. We started early this morning at the Super 8 Motel on Metcalf. We spent all morning loading the Penske truck and all afternoon driving to Little Rock. We arrived home safely about 8:30 tonight. I am very glad this day is over, but very sad that I had to leave Kansas City for the last time. When we come back we'll just be visitors. My SODS career with Sprint, IBM, and Embarq is over. Today was my last day with Embarq and because of the ice they let me work from home. How nice to end my career working from home. I should be happy but I keep thinking about this is the last time to do this or that. I am feeling sad leaving a 15 year career and a big chuck of our lives here in Kansas City. Well I must get over it and move on. The Penske truck is about 1/2 to 2/3 loaded, so in the morning we hope to finish loading and head to Little Rock. Thank the Lord for His unspeakable blessings and joy. Yesterday and last night we have had a lot of freezing rain. The weather girl said there is more to come so we went to Van Wall Equipment Company this afternoon and purchased a 2000 watt Honda generator just in case we lose power. We have wanted this gererator for a long time for our home in Arkansas. So far we have not lost power but thousands of other people have lost power in the Kansas City area. This was a sad visit. My checkup this afternoon with Dr. Whitaker was my final visit with him before moving to Arkansas Thursday. We have enjoyed his services. He has been the best family doctor that we have ever had. We truly hate to lose him as our family doctor. It seems like there are a lot of "last things" happening to us lately. I must get over it and look to the future for what God has for us. We sure hated to see them go but they said they had to get back to the kids and Lacey's job. We met them at the Ihop Pancake House in Grandview on their way out of town. Scott reported that they had a little trouble with ice on the roads near Joplin. He said it was a winter wonderland down there. When they got to Little Rock he said it was warm. We spent the day just driving around Kansas City with Scott and Lacey. We made it to Crown Center for early lunch. Then we went to the World War I Museum. That was our first trip to the museum since it was remodeled a few years ago. It is fantastic. I sure am glad we took the time to visit it before we leave town for good next week. We met Robby and Rachel at Buca's on the plaza for supper. Great food! Since we had a little snow the boss said we could work from home today. I took her up on it. After Scott got his stitches taken out of his hand, he and Lacey drove Mary up to Kansas City this afternoon. We went to the Mongolian Grill over by Oak Park Mall for suppper tonight. It was fantastic! Today's walk with my friend Chris Wilson will probablly be my last chance to walk around the Sprint Campus. We had a ball walking in the snow today. I will truly miss walking at noon with Chris and Andy. One week from today I will walk out of the building and leave the Sprint Campus for the last time. It is enough to bring tears to my eyes. I don't want to leave but feel that I must leave. I must learn to trust God. I had the grand opportunity to go to Brian and Carlin Yonke's home this evening for dinner. Carlin is a champion cook and always serves a delicious meal. Our good friends Terri and Jimmy Finfrock, code named Team Six Pack, were also in attendance. We did a lot of eating and reminiscing about my geocaching days. I thoroughly enjoyed my time with the Yonke's. Thank Carlin for the fantastic meal. 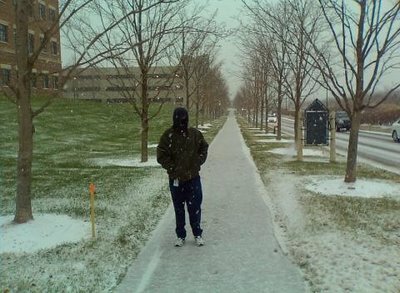 Today was the first time this winter season that we wore two layers of coats to make the walk around the Sprint Campus. It was cold and the north wind was really whipping it up. In spite of that I took off the top layer after the first round and I took off the second layer toward the end of the 3 miles. I finished the walk carring both coats. It was really sad this afternoon making my way back to Kansas City for my final trip. These drives have been long and tiring but there was a certain amount of enjoyment during those long drives back and forth between Little Rock and Kansas City these past couple years. 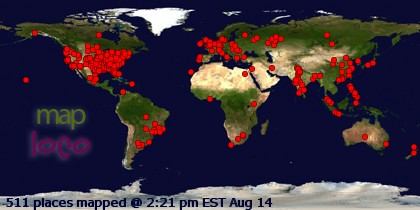 I have had time to think and listen to many CD's and streaming audio from the internet. I think I am actually going to miss these drives. Today Lee and I attended the Ladies Christmas Brunch at Crystal Hill Baptist Church. I setup 3 cameras and videoed the entire event to DVD while Lee ran the audio equipment. Thank goodness for good audio. A video with good audio is nothing. It was a whole lot of work to setup and then we had to set it all up again this afternoon so we would be ready for the early service in the morning. I worked hard for this event from 7:30 a.m. until about 4:30 p.m. this evening.